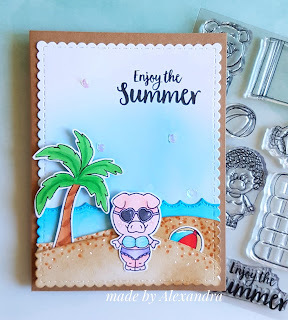 Next I stamped the cute piggy and colored it using Spectrum Noir Alcohol markers ,and then put together the shaker card. Also the sentiment is stamped on the inside of the card on the watercolor paper. Kimberly from Kimberly's Crafty Spot as a Guest Designer. I made another summer inspired card using the Pool Piggies 4x6 clear stamp set. For the card, I started by water coloring a piece of water color cardstock with several blue distress inks then added some water droplets, finally I sprayed it with some shimmer mist to sparkle. This will be the water part of the river for the pig to float on. 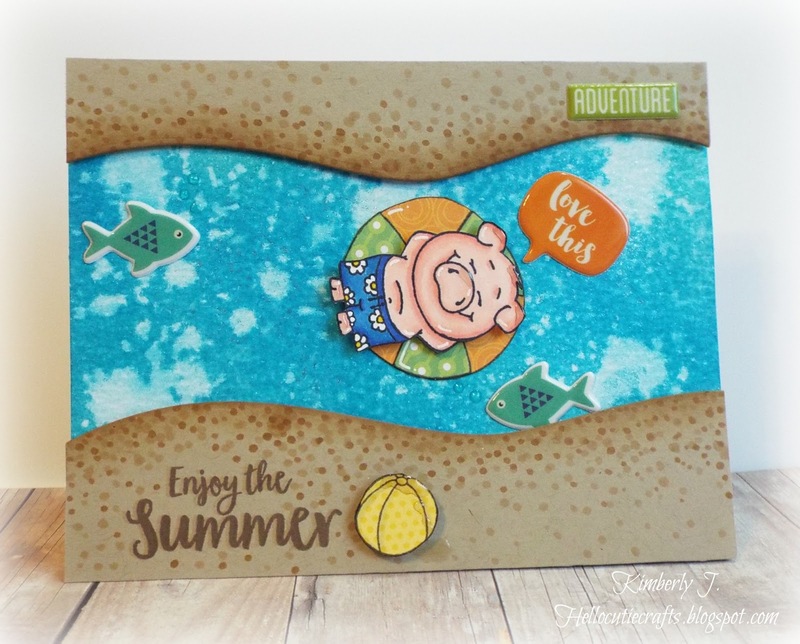 Then, I took some kraft card stock and die cut it with some wavy border dies to look like the beach or shore, depending on where the river is, I added some dots with copic markers to look like sand. 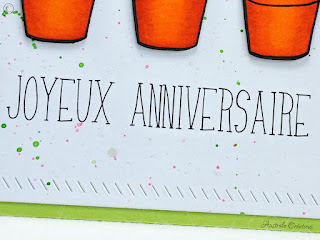 I also double stamped the sentiment in two colors of ink, with a misti stamp tool, in tan and brown. 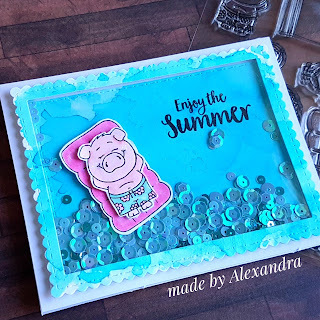 Next, I stamped and colored the pig, then I stamped the round float and ball on some patterned paper and paper pieced the float. I added some glossy accents to the ball, pig to look like water droplets and to the fish for bubbles. 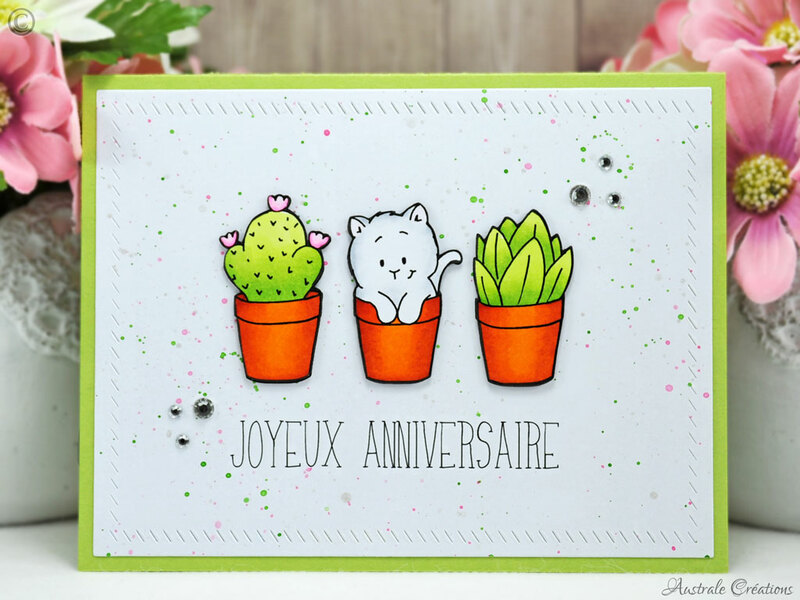 Then I added some stickers to the card for some accents. The pig looks like he is having fun and so relaxed!! Thanks again to Gerda and Macy for letting me be a guest designer. I hope to have inspired you ! For more details or supplies, please visit my blog. Hello everyone! 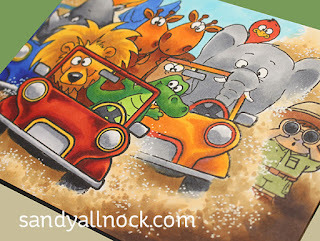 I'm Sandy Allnock - and I'm excited to pop over for a guest post here. 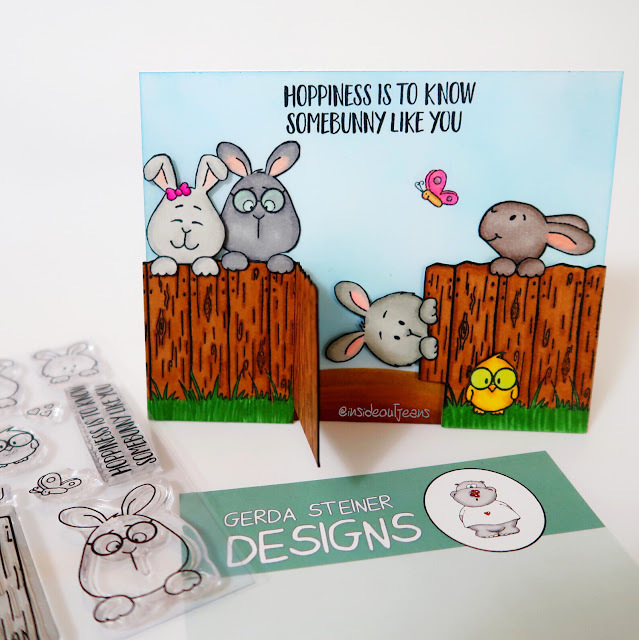 I'm a coloring fanatic....and as you know, the Gerda Steiner stamp sets are MADE for coloring! 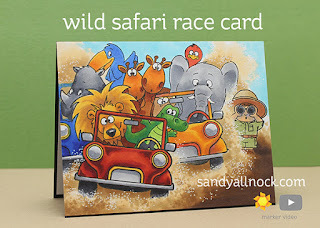 I've had my eye on the Go Wild stamp set for a bit....I wanted to create a "race" card...and see just how many wild animals I could fit into the land cruisers on just one card. I added the Party Animals just for kicks - to make it truly nutty! The little person is just a spectator...and I really hope he stays out of the way when the race comes by! In the video I show you a quick walk-through of how I layered the images. In general, when masking - start with the image in the front and work your way backwards from there. 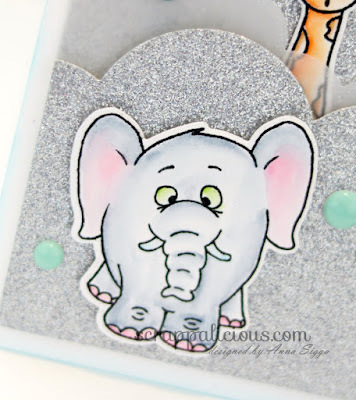 To create room for the dust, wipe off stamps to remove some ink before stamping. Wasn't that just a blast!? The kittywompus cars filled with animals and happy color were just so enjoyable to color. Hi everyone! Jeannie here from InsideoutJeans... annnnd... is it summer yet?! 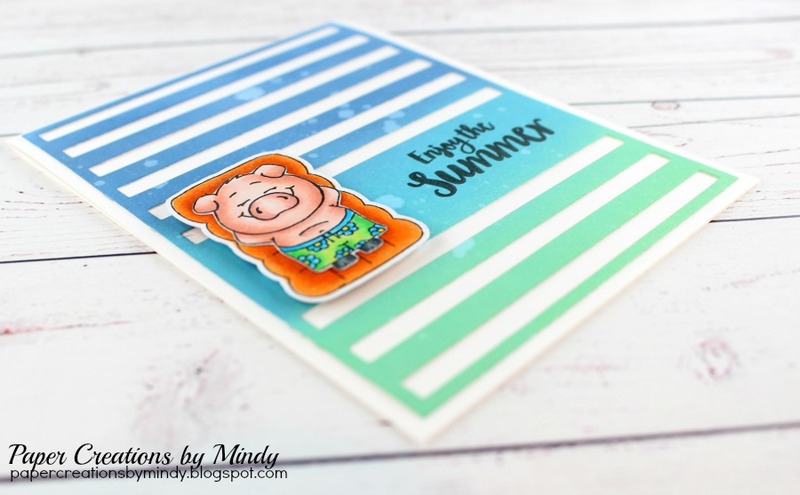 This new Pool Piggies stamp set makes me want to head to the pool ASAP. There's a few elements that pull this scene together. 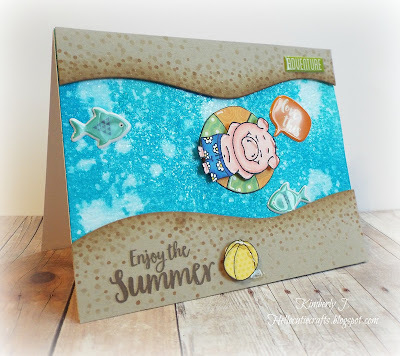 For the beach, I cut out the sand part from white paper and used distress inks to make it a sandy color. I added light brown dots around the edges to give it a more dimensional look. For the ocean, I cut out waves from vellum and colored the edges using distress inks. I wrapped the three wave pieces around the card and glued it down from the back. By doing so, the vellum isn't completely flat and vellum raises slightly from the card looking like real waves. Now for the interactive part! I didn't want to use foam tape in this instance. The difficulty with using vellum is that it is see through, any glue or tape will show through. I wanted it to look seamless. It ended up being really easy! I punched a hole, using a single hole puncher, in the wave. I used a small circle as a backer. I sandwiched the pig and the small circle with a glue dot in the middle of the hole in the wave. 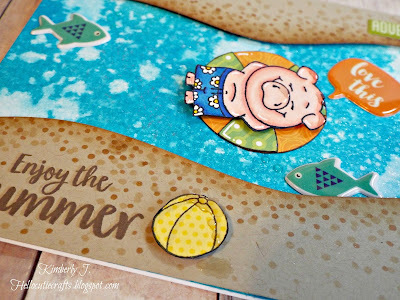 This way, the piggies can float in the water without all the bulk. Hope you all enjoyed the card. This set is super cute and gives me all the summer feels! Hello!! 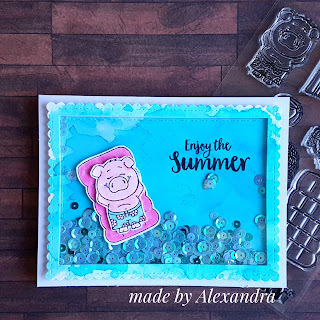 This is Mindy from Paper Creations by Mindy and I'm super excited to be Guest Designing for Gerda Steiner Designs for this super cute Pool Piggies stamp set! There are so many super fun summer cards I have in mind! My first card is with a fun distressed background. 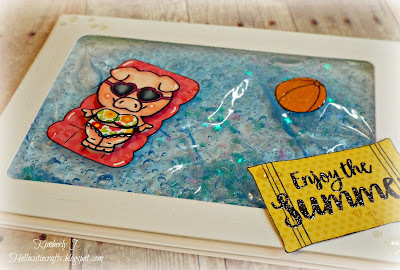 I used my Tim Holtz distress inks but this background was one of a few that I was experimenting with and unfortunately forgot to write down my colors. Lesson learned! If I were to venture a guess - I would say Cracked Pistachio, Broken China and Faded Jeans. 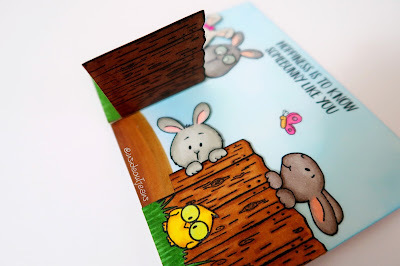 I diecut the distressed background with my Striped Sentiment Strip Die to create the white lines. I thought it broke up the background nicely. Hi Everyone, Kimberly from Kimberly's Crafty Spot. 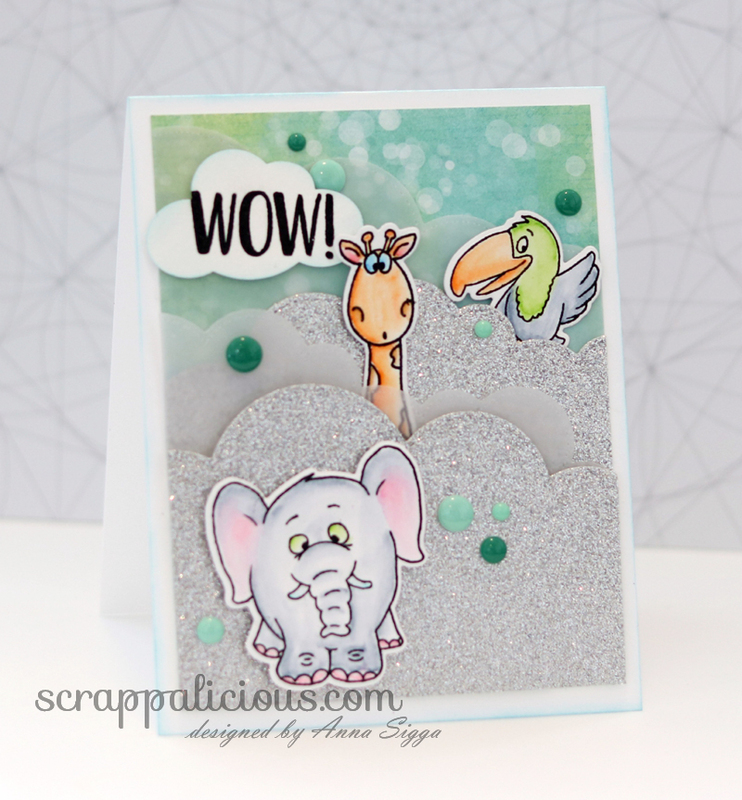 Today I am sharing a fun card as a Guest Designer for Gerda Steiner Designs. (This blog post contains affiliate links. Compensated affiliate links used when possible at no extra cost to you. 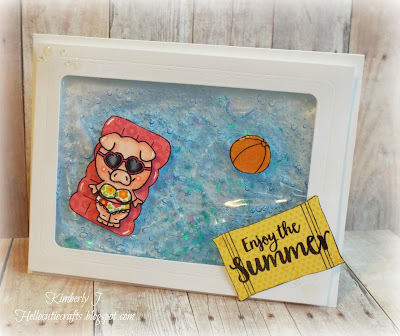 For my card, I made a gel card for the cute piggy from the Pool Piggies 4x6 clear stamp set to float in on her little pool floatie. I started the card with a white rectangle, then I die cut a rounded rectangle from it and also embossed the edge of the rectangle. 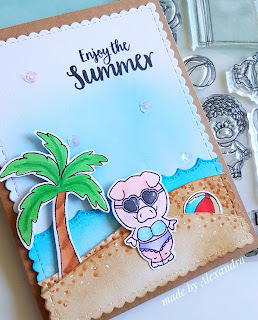 Then I stamped the cute pig and colored her with copic markers, I paper pieced her bikini, pool float, towel and ball from the Sunkissed 6x6 Doodlebug paper. Next, I added some glossy accents to her sunglasses and the ball. Then I stamped the sentiment from the set on the towel and heat embossed it in clear. Next, I made the 'pool water' portion of the pool. I used a small snack size ziplock bag, I cut it down to size and sealed it with my fuse tool. Then I added some heart and star sequins to the bag then some blue hair gel, then more sequins and again until my bag was full enough. Then I adhered the bag to the backside of the die cut rectangle panel, then added that to a white card base with foam adhesive. Next, I added the cute pig and ball to the water panel, then the towel with the sentiment to the bottom right corner. Finally, I added some glossy accents around the card to look like water droplets. The card is so fun, if someone presses on the gel it moves just like water and the cute pig goes up and down. I hope you were inspired by my card, I know I am ready for summer and some fun pool time! Thanks to Gerda and Macy for giving me the opportunity to be a guest designer again, I am honored. If you would like a list of the supplies used or anymore details, please visit my blog. 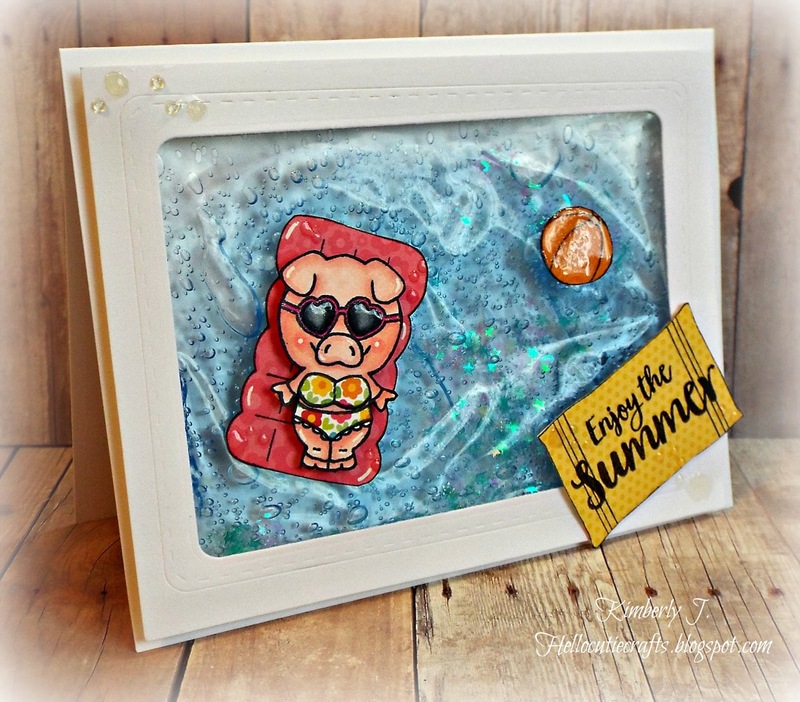 Those piggies just make me giggle ! They are cuteness overload! 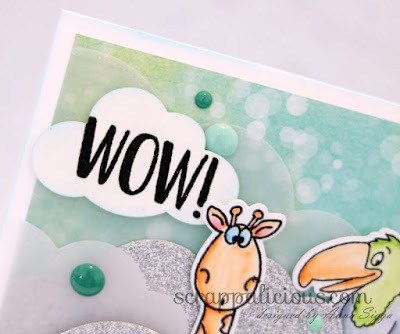 For this card i started by inking the background using Salty Ocean distress ink and that is my sky! Next i die cut the ocean waves and the sand borders and the inked them using Mermaid lagoon distress ink and Vintage photo distress ink for sand borders. 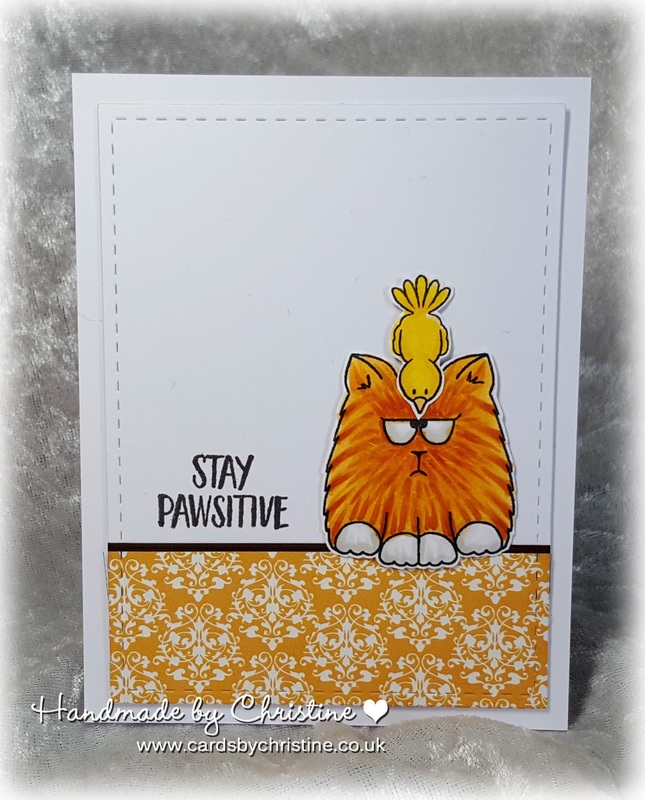 Christine here today - to share a card I made with the fabulous All Cats Stamp Set. 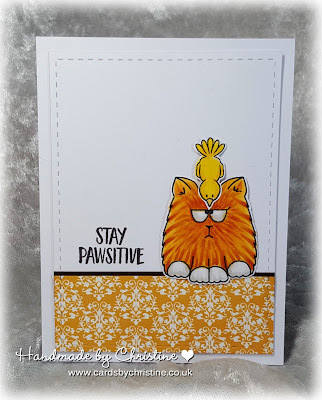 The set has three cats and a little bird in all - with fabulous sentiments too! 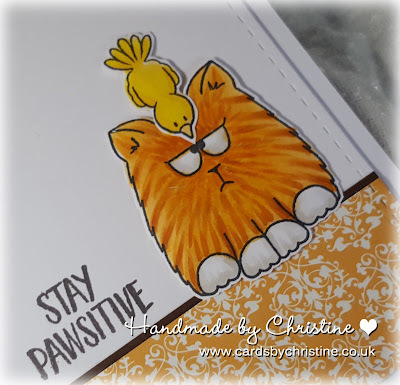 I stamped and coloured the kitty (my take on a marmalade cat!).. then coloured the bird too. 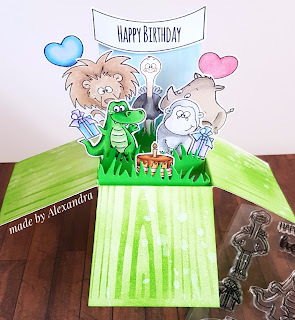 I fussy cut both, and then shaped and used a 3D foam pad to adhere them onto my card. I used a scrap of designer paper to sit the cat on. I used one of the fab sentiments alongside - this is what the birdie is telling the kitty.. hope she takes notice! A big thank you to Gerda Steiner Designs for allowing me to Guest on the Design Team - I've love being a part of it! Hello again! It's Jeannie from InsideoutJeans. 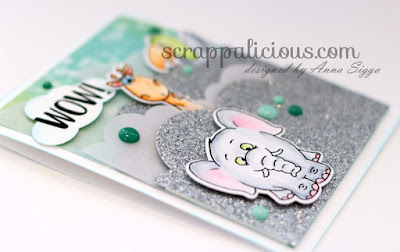 I'm glad to be back on the GSD blog to share another card with you. I really love doing interactive cards but sometimes, simple is so pretty! 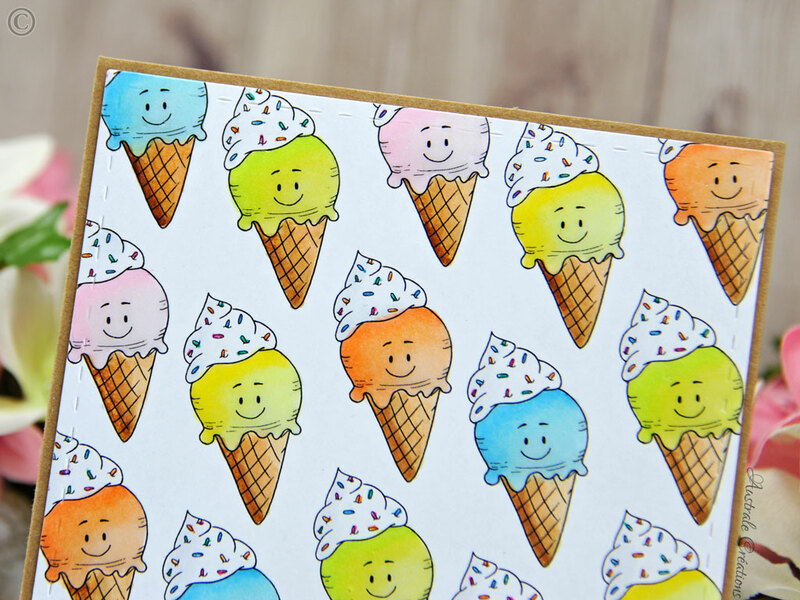 This time, it's a really easy, fun, and colorful card using the adorable waving unicorn from Moody Unicorns. 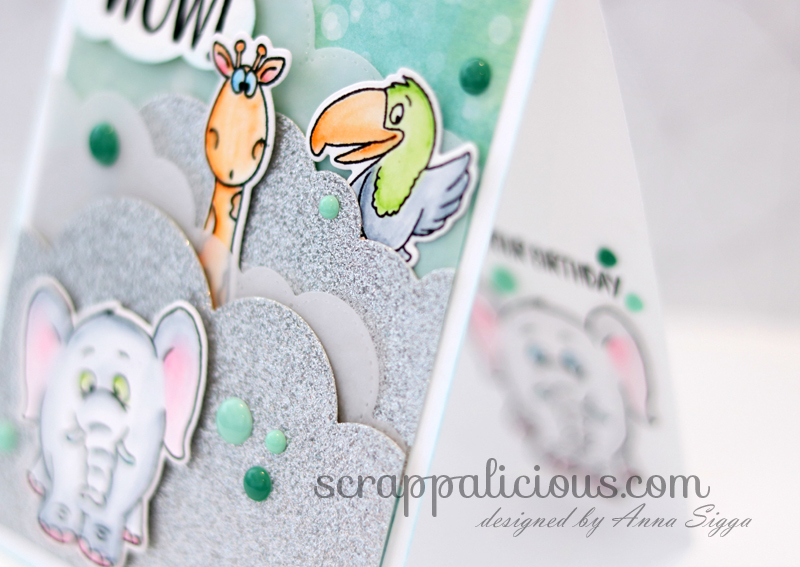 Usually, a stamp set has a lot of smaller stamps that can be used to create a gorgeous background. I really had fun creating this one. The best part is that it's really easy to recreate. 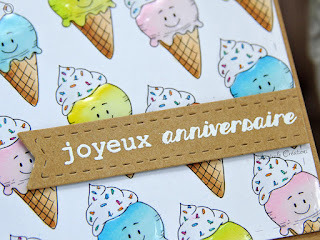 First, I used some vellum paper and stamped the cupcake and present randomly using Versamark ink. 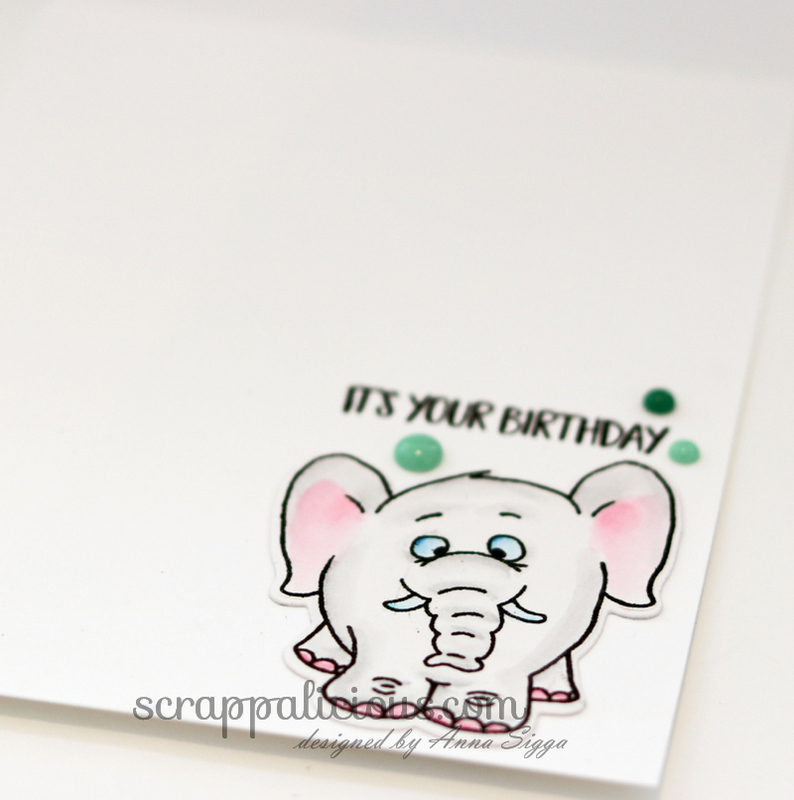 Afterwards, I used white embossing powder and heat set it. Now the fun part! You don't need many different ink colors or anything. I just used my Spectrum Noir markers I had on hand. I flipped over the vellum and colored the back of the stamp, outlining it a bit and coloring it solidly behind. When you flip it over again, you can see that the white heat embossed image looks amazing against the different colors. The array of colors work with the unicorn perfectly. 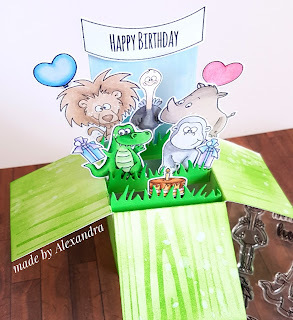 I originally had just die cut out a rectangle box for the sentiment, leaving it white so the unicorn could stand out, but it just looked funny. 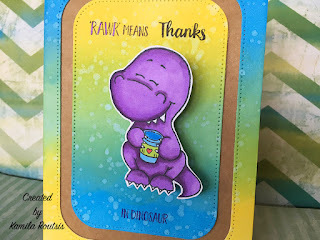 I needed some color added to the sentiment, so I used distress inks matching the markers I used to create a soft, colorful border around the sentiment. What do you know? It matched the unicorn perfectly. Hope you enjoyed my card and will create something similar. I'd love to see them! My name is Jeannie from InsideoutJeans. I have quickly fallen in love with Gerda Steiner stamps every since spotting the Moody Unicorns on Instagram. I’m here today to feature a set that I’m currently loving right now, Hoppiness. I really love making interactive cards and here’s one that was in my mind before I even got hands on this set. 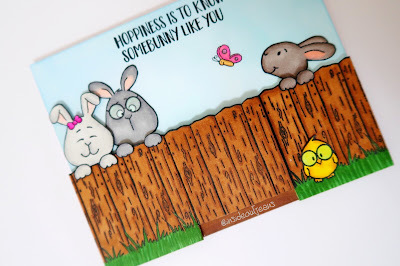 I wanted an unexpected, hidden surprise for someone receiving this card and the fence stamp that comes in this set works perfectly for this! The peeking bunnies allow me to have a hidden bunny peeking behind the opening fence. All you need to do is open the fence and you'll see his curious face staring at the bird! Hope you all enjoy this fun, spring card! 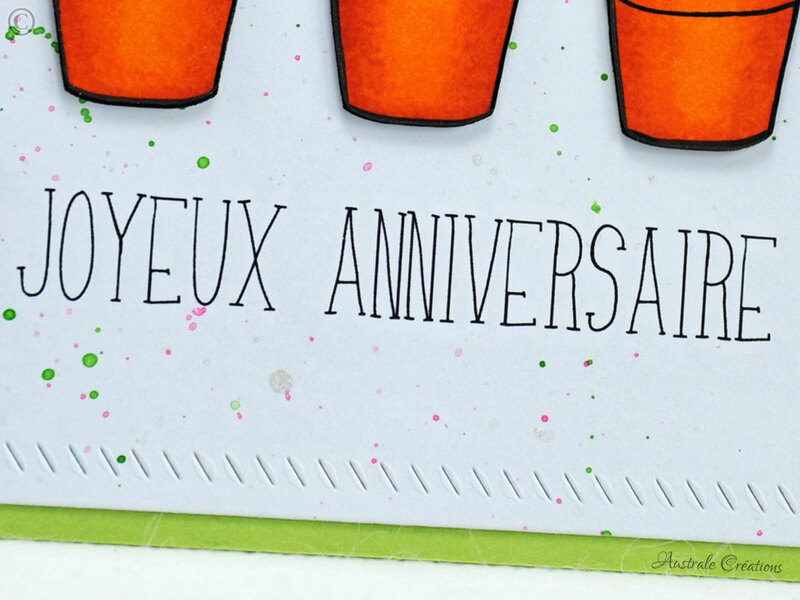 It's Céline from Australe Créations, I’m so happy to find you, I hope you are well ! Today I propose to give in to temptation with beautiful digital stamp I Scream for Ice Cream ! 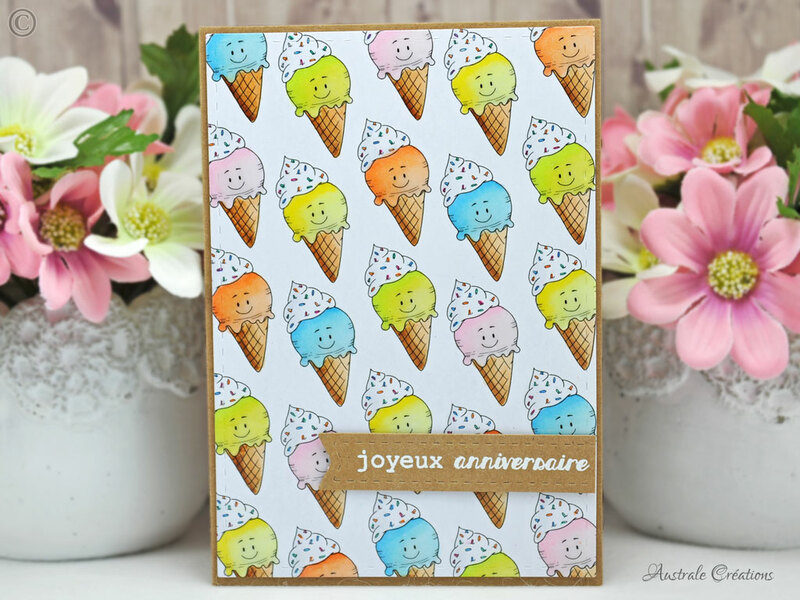 I made a background of ice cone, colored with Copic Markers, wink of stella et glossy accents,..
Hello again - it's Anna Sigga here with another Go Wild card. 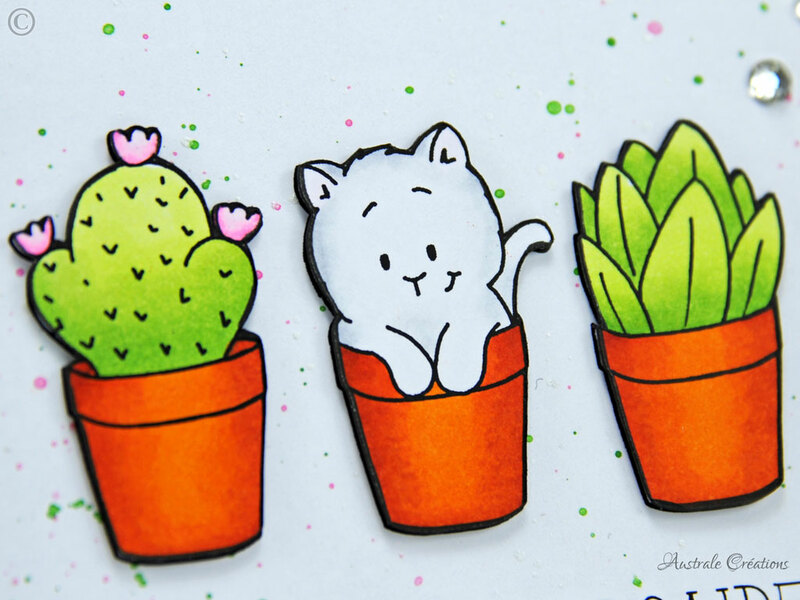 I just adore this stamp set to bits - and these lil critters are so darn cute. Cause these are so adorable and cute I wanted to create a dream-like card using clouds and soft colors. The Go Wild dies make these kinds of cards a breeze to put together. And since we are all dream-like I just had to add some sparkly clouds too - cause sparkly clouds are awesome right?!? 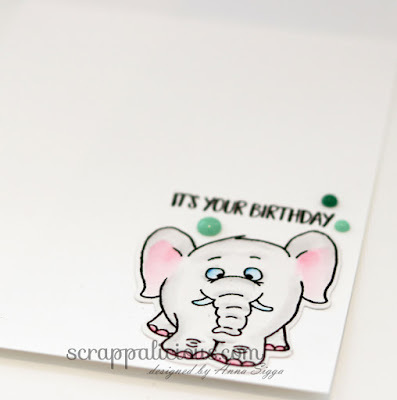 I used part of one of the sentiments that come in this set to stamp on the inside of the card. 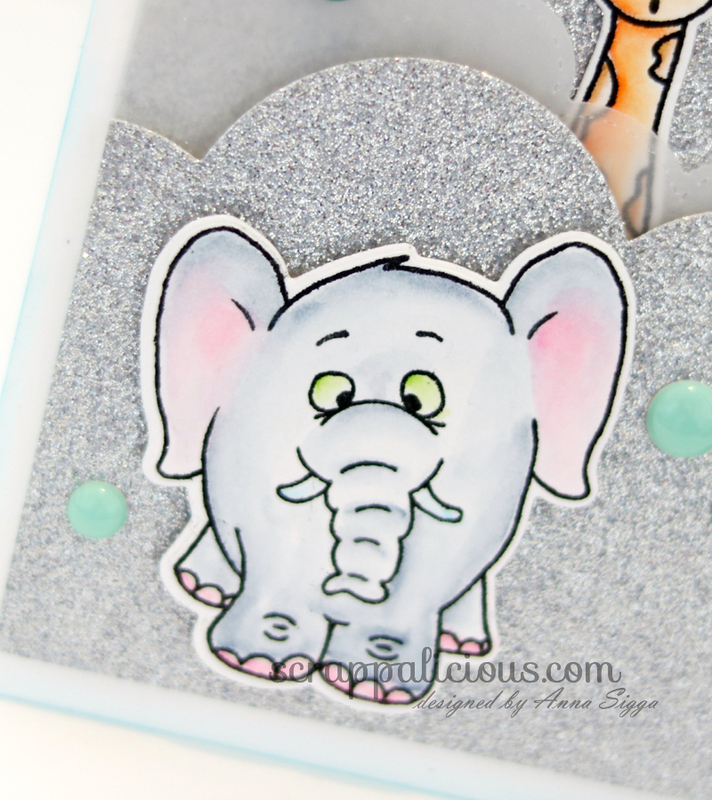 And I just had to put one more elephant on the inside cause these images are just too fun. 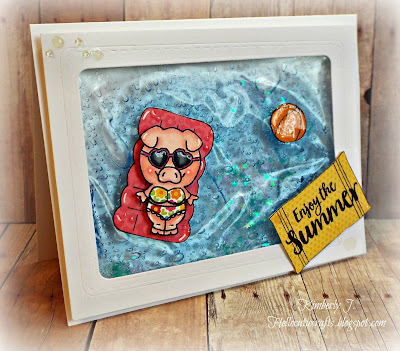 Thank you so much for stopping by and I have had so much fun guest designing for Gerda Steiner Designs this month. 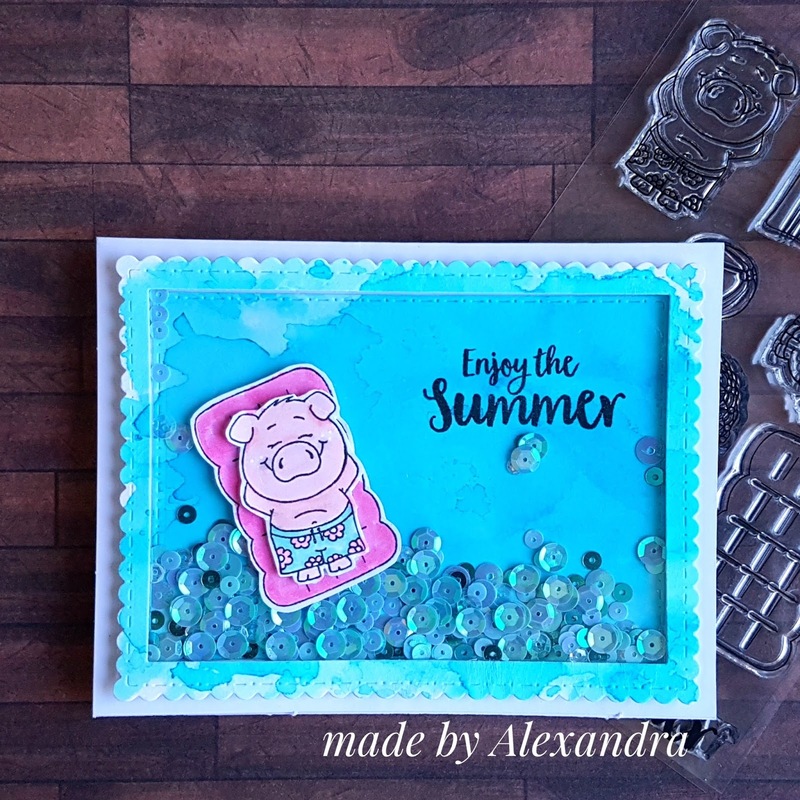 I did some ink blending on the background with fun summery colours and I sprinkled some simmery droplets so add some texture.